OK, yesterday I talked about the heart of Sukkot: it’s about hospitality, welcoming guests, being a guest, sharing food, being outdoors with other Jews and with friends and neighbors. And I am pretty sure that someone was thinking, yes, but that’s not really Sukkot. You want the terminology and stuff, right? So now we’ll talk about that. WHAT IS SUKKOT? Sukkot [soo-COAT] is the plural of Sukkah [soo-KAH], which is the Hebrew name of the little booth we build for the holiday. You may also encounter the Yiddish pronunciations, [SOOK-us] and [SOOK-uh]. It’s also the Jewish harvest holiday that follows the High Holy Days. WHEN IS SUKKOT? Sukkot is a fall harvest holiday. It begins on 15 Tishrei, the fifth day after Yom Kippur. It lasts for eight days (seven days in Israel). It will begin on the evening of Sept 18, 2013. On the first two days and the last day of Sukkot observant Jews do no work. WHY DO WE DO THIS? Sukkot started as a harvest holiday. Nowadays it is a chance to foster our relationships with friends and family. Remember, we just spent the last six weeks mending our relationships — now it’s time to enjoy those improved relationships! The little sukkahs also remind us of our temporary dwellings in the wilderness, and of the impermanence of most possessions. The observance of Sukkot is commanded in Leviticus 23:40-43. HOW DO WE OBSERVE SUKKOT? Sukkot is unique in that we actually build the place where we celebrate it fresh every year. A sukkah (soo-KAH) is a little shed built to very precise directions, open on one side with a very flimsy roof of branches or reeds. We build it outside and eat meals in it. Some people actually sleep in their sukkah. Many Jews entertain guests in the sukkah, and in Israel, many restaurants also have them for customers to enjoy. 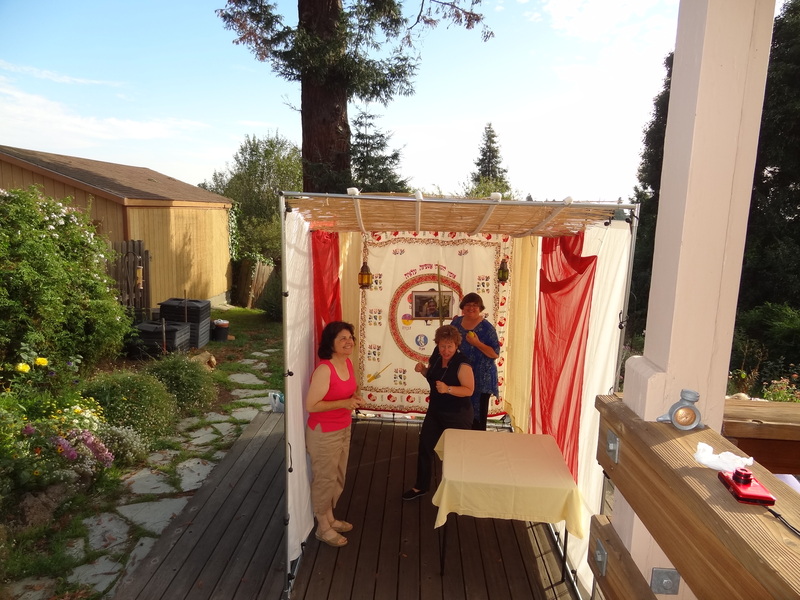 It’s customary to decorate the sukkah with hangings, artwork, and home-made decorations. WHAT IS A LULAV? 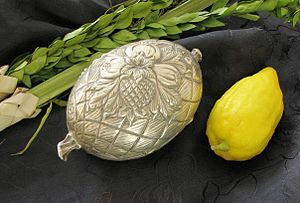 Observant Jews also “wave the lulav.” It’s a bouquet of palm, willow, and myrtle, held alongside an etrog (citron) and waved to all the compass points, with a blessing. If you want to learn about waving a lulav and etrog, you can find more information here. ARE THERE ANY MOVIES ABOUT SUKKOT? Yes! There’s a very funny Israeli film Ushpizin which is set in a very traditional community in Jerusalem during Sukkot. Ushpizin [oosh-pee-ZEEN] or [ush-PEE-zin] are visitors to the sukkah. Go on a picnic with family or friends. Get out in nature! Go for a hike! Invite friends over that you haven’t seen for a while. Reach out to someone you think might become a friend. Reach out to someone who seems lonely. Reconnect with someone you’ve been meaning to call. Rejoice in the natural world, however you best do that! Sukkot is a great time to practice the mitzvah (commandment) of Hachnasat Orchim, Hospitality. Whether you spend this Sukkot as a guest or as a host or (best of all!) a little of both, I hope that you are able to spend some time with friendly people, enjoying the fall weather! Tu B’Av is a minor but fun Jewish holiday. After the mourning of Tisha B’Av, this is a lovely little day to be happy and to celebrate love. Today in Israel, it’s called Chag HaAhavah, the Holiday of Love, and it’s a favored day for weddings. Think of it as Jewish Valentine’s Day. In Temple times, in Jerusalem, the grape harvest began on the fifteenth of Av and ended on the tenth of Tishrei, Yom Kippur. On both those days, single girls dressed in white and went to dance in the vineyards in the afternoon. It was a traditional time for courtship. Posted on July 22, 2013 July 21, 2018 Categories Especially for Beginners, Jewish Time, The Jewish YearTags Av, Jewish holiday, Tisha B'Av, Tishrei, Tu B'Av, Valentine's Day, Yom KippurLeave a comment on What’s Tu B’Av? WHAT DOES SUKKOT MEAN? Sukkot [soo-COAT] is the plural of Sukkah [soo-KAH], which is the Hebrew name of the little booth we build for the holiday. You may also encounter the Yiddish pronunciations, [SOOK-us] and [SOOK-uh]. WHO CELEBRATES SUKKOT? Jews worldwide celebrate Sukkot, although the holiday is most festive in the land of Israel. WHEN IS SUKKOT? Sukkot is a fall harvest holiday. It begins on 15 Tishrei, the fifth day after Yom Kippur. It lasts for eight days (seven days in Israel). It will begin on Oct. 1, 2012. On the first two days and the last day of Sukkot observant Jews do no work. WHAT’S THE POINT? Sukkot started as a harvest holiday. Nowadays it is a chance to foster our relationships with friends and family. Remember, we just spent the last six weeks mending our relationships — now it’s time to enjoy those improved relationships! The little sukkahs also remind us of our temporary dwellings in the wilderness, and of the impermanence of most possessions. The observance of Sukkot is commanded in Leviticus 23:40-43. WHERE DO WE KEEP SUKKOT? Sukkot is unique in that we actually build the place where we celebrate it fresh every year. A sukkah (soo-KAH) is a little shed built to very precise directions, open on one side with a very flimsy roof of branches or reeds. We build it outside and eat meals in it. Some people actually sleep in their sukkah. Many Jews entertain guests in the sukkah, and in Israel, many restaurants also have them for customers to enjoy. It’s customary to decorate the sukkah with hangings, artwork, and home-made decorations. WHAT ELSE HAPPENS DURING SUKKOT? Observant Jews also “wave the lulav.” It’s a bouquet of palm, willow, and myrtle, held together with an etrog (citron) and waved to all the compass points, with a blessing. If you want to learn about waving a lulav and etrog, you can find more information here. There are also special festival readings and prayers of praise in the synagogue.